The Bulldogs wore the Maroon MS jerseys in all three games, wearing gray pants on Friday, white pants on Saturday, and gray pants again on Sunday. This is the first time this year the Bulldogs have worn the same jerseys in consecutive, non-doubleheader games. The Bulldogs wore the white throwback jerseys in their midweek game vs Alcorn State. 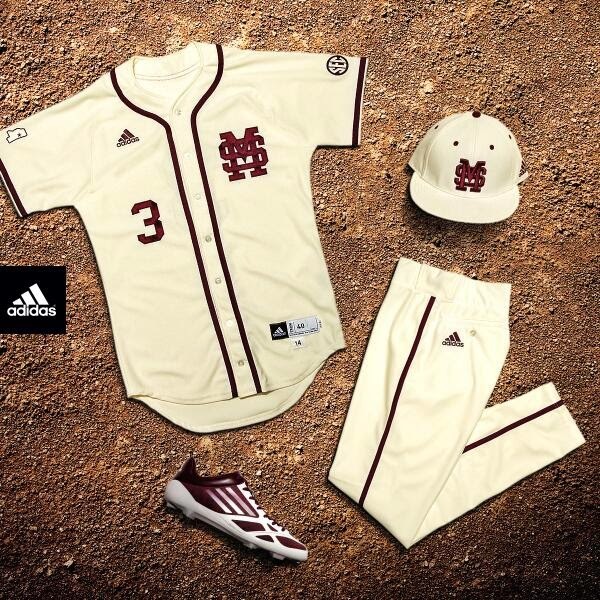 The Bulldogs wore newly-unveiled cream Adidas jerseys in Saturday's game vs. Ole Miss. The jerseys are the 8th different ones the Bulldogs have worn this year, and one of the better ones. As they have in their last few midweek games, the Bulldogs wore their white vests in their annual game vs. Southern Miss at Trustmark Park. In the first game of their weekend series at LSU, the Bulldogs wore the Maroon Throwback Jerseys with Gray Pants. In game 2, they wore the Maroon MS jersey with white pants, and in game 3 they wore the black jerseys with gray pants.